Days of the New is an alternative rock band from Louisville, Kentucky, formed in 1995. The band consists of vocalist/guitarist Travis Meeks and a variety of supporting musicians. They are best known for the hit singles "Touch, Peel and Stand" and "Shelf in the Room," both from their self-titled debut album. Early years Days of the New began as an experimental rock/metal trio called Dead Reckoning, with Meeks, Matt Taul, and Jesse Vest. When they turned to an acoustic sound, they changed the name of the band, as well as added guitarist Todd Whitener. Days of the New began as an experimental rock/metal trio called Dead Reckoning, with Meeks, Matt Taul, and Jesse Vest. When they turned to an acoustic sound, they changed the name of the band, as well as added guitarist Todd Whitener. A demo version of the song "Freak" appeared on the Harvest Showcase Volume 3, a compilation of Louisville area artists. This recording features a solo performance by Travis Meeks but is credited to Days of the New. Jesse Vest and Matt Taul are listed as band members in the liner notes; although, they do not appear on this recording. 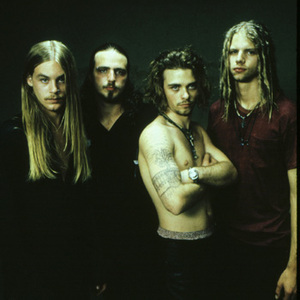 The band recorded their debut album in October and November 1996. The first Days of the New release, an eponymous album frequently called "Orange" or "Yellow" after the color of the disc and liner notes, was released in 1997, selling 1.5 million copies worldwide. Three songs from this album were hits: "Touch, Peel and Stand," "The Down Town," and "Shelf in the Room." The former was #1 on Billboard's Rock Chart for 17 weeks; "The Down Town" and "Shelf in the Room" were each top 40 hits. Just before starting this summer tour, however, Meeks had already told interviewers that all of his fellow band members were holding him back and, consequently, were being released from the group. He also said that they were disappointed by this decision but that he thought they would remain friends. An Outpost spokesperson, however, claimed that "Travis just talks" and that nothing was official. Before they could fulfill club touring duties with Finger 11 and Flight 16 in December, without citing reason, Meeks canceled in early November. Various explanations were given by band members and a label spokesperson including poor tour scheduling, band fighting, and even Meeks being physically ill. It was finally confirmed in February 1999 that the band indeed split up. Todd Whitener, Matt Taul, and Jesse Vest would go on to form C14, soon renamed Tantric, while Meeks formed a new band under the Days of the New name. Just one year after the original band's breakup, Meeks had assembled a new Days of the New and recorded a second album. Titled Days of the New, and often referred to as "Green." The album was released August 31, 1999 and introduced a variety of different styles. Many of the album's songs contained intros and codas to seamlessly carry into the next song. Meeks debuted his new band on September 4, 1999 at the Ear Xtacy store in Louisville. Critics were fairly enthusiastic of "Green," but the album sold poorly compared to the first, selling around 450,000 copies. The lead single, "Enemy," was a major hit while its follow up single, "Weapon and the Wound" met with marginal success. After touring to support the album, Meeks contributed to the Doors tribute album Stoned Immaculate: The Music of the Doors as lead vocalist on a cover of "The End" and "L.A. Woman." In February 2000, Meeks returned to the studio with a new band and was finished by July. Still using the Days of the New name, the third album incorporated aspects of the previous two - much of the energy from the first album had returned, combined with orchestral interludes similar to the second album. In keeping with the previous albums' names, the third album is also called Days of the New, or "Red." The first single "Hang On to This" charted fairly and was the most added song on rock radio the week it was released. However, the album was released two weeks after the 9/11 attacks and, with very little promotion, only sold 90,000 copies. The band maintained a profile touring with the likes of Creed and 3 Doors Down. After touring for "Red," the band went through a period of inactivity, when they parted ways with Interscope. In the later half of 2003, Travis Meeks embarked on a solo tour performing at small venues. He continued to suffer from drug addiction and, in early 2005, appeared on A&E's Intervention, where his family and friends convinced him to enter rehab and battle his addiction to methamphetamine. In September 2005, Meeks declared sobriety, and resumed writing for a fourth Days of the New record, with the tentative color being Purple. After relocating to New York to reunite with Ray Rizzo, they began touring. In October 2007, the band entered a studio in New York to begin work on Purple. It has been hinted that the record may be recorded and released independently, giving the band artistic freedom and less pressure to be commercially successful. The record is said to have a theatrical sound, with the incorporation of upright bass, koto, hammered dulcimer and cello. Some of the songs tracked for the record include "Superhero," "Touch of Anger," and "Where It Ends." The album will be financed through fan pre-orders and donations via Paypal. On March 4, 2008, Days of the New released their first compilation disc, Days of the New: The Definitive Collection. In an interview with LEO Weekly, an alternative magazine out of Louisville, Kentucky, Travis stated that the upcoming record will be called Days of the New Presents Tree Colors. August 2011. Days of New has cancelled their current tour and according to their manager Travis Meeks has entered rehab for an extended period of time.